A devoted fan spoke to the media today about her aspirations to emulate her heroine and Big Brother 8 contestant, Chanelle Hayes. "Chanelle is my hero," said Chardonnay Bucket, 18, from Formby in Merseyside. "I have followed her entire week-long career and think she is just wonderful. 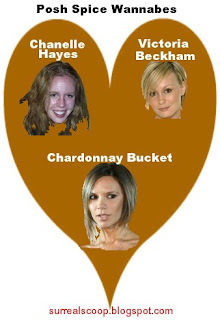 The way she wants to be Victoria Beckham makes me just want to be Chanelle Hayes." Chardonnay says that she still has a lot to learn from her idol and is avidly following Big Brother’s live broadcasts on E4. "She is just the best at saying ‘Stupid’ at the end of every sentence and speaking in one long endless sentence that seems to only repeat the stuff that she has already said several times and is delivered as though she is fighting for air after nearly drowning, before saying ‘Stupid‘ and repeating herself again and again," gasped Chardonnay. Miss Bucket says that it will take her time to fully master the talents of Chanelle, but that she is determined to put the effort in. "I need to practice more on some of her other talents. I got a bit engrossed in heat magazine yesterday and didn’t use my hair straighteners for 45 minutes, for example." "I can sit and talk about make-up for hours, just like Chanelle. I look great in my underwear, but I am still studying for my A-Levels at the moment, and still a virgin. Stupid!" she blushed. "Nothing sordid for the papers yet. Stupid!" As Chanelle wants to use her talents to follow Victoria Beckham to Madrid and Los Angeles, Miss Bucket is hopeful that she can follow Chanelle’s stellar career. "I plan to go to Madrid this summer, and I hope I can get a video of me being shagged by a Spanish barman wearing a Real Madrid football shirt," revealed Chardonnay. "Then it is practising sitting around and bursting into tears about hair and make-up until Big Brother 9 comes round." Chardonnay hopes that she can get her pop career over and done with before she returns to school this September. Her first single, a cover of the Victoria Beckham’s ‘Not such an innocent girl’ reached a peak of 26 in the Australian chart on Sunday (ten places higher than the original version achieved) before plummeting out of the top 500 today.